• Mount Pleasant Place (Joyne’s Cottage) demolished by the new owner (Colonel Dalton of Parrock Hall) and the estate turned into a market garden. • There were 27,291 recorded visitors to Gravesend. • Population of Gravesend and Milton 6,583. Population of Northfleet 1,964 with an estimated 351 dwellings. • Last Turnpike Act revoking all others and remained in force for 21 years. • Work on the Market recommenced (see 1820) and the colonnades on the west side of the Town Hall were completed. • A cricket match at Shorne, between fifteen members of the Botting family from Shorne and fifteen members of the Baker family of Cobham took place and the team from Shorne were the victors. • Windmill on the Hill broken into and three sacks of flour stolen. • Gravesend & Milton Gas Light Company formed and Gas works were erected in Bath Street. The town was lit by gas in September of that year. • The Thames and Medway Canal opened in October. • An Act of Parliament authorised a turnpike road from Gravesend to Wrotham, a distance of 11 miles. • The office of “Searchers” of Gravesend abolished, established in 1356. • The Customs and Excise merged and took over the building on the site of the “Old Fountain” as a Custom House. • The Corporation bought premises on west side of quay known as “The Christopher Inn” or “Haunch of Venison” for £2,300 to be demolished to improve access to the town quay. • First Baptist congregation assembled in a public room at Stone Street. • Over 70,000 recorded visitors to Gravesend. • William Penney’s circulating library and reading room established at 10 Milton Place. • Thomas Caddell printed a map of Gravesend town. • General Steam Navigation Company put vessels into service at Gravesend (until September) in competition with the existing company due to the popularity of the resort. • Public meeting at the town hall to approve the Town Quay improvements. • Act of Parliament to control pilotage above Gravesend. • Act of Parliament for improving and maintaining the Town Quay and landing place - empowered a toll charge of 1d. on each passenger. A plan for an enlarged quay prepared by Mr Roper of Denton Court and work commenced on the demolition of the “Christopher Inn” and building of the Pier Hotel on the site. • Gravesend and Milton Steamboat Company formed. • Barnes and Miller, steam engine manufacturers, obtained permission for the “Sophia Jane” to operate from Gravesend. • Vessels “Kent”, “Pearl” and “Essex” launched by Gravesend and Milton Steamboat Company. • Town Quay rebuilt by a Mr McIntosh - cost £3,880. Official opening on 28th August, Lord Mayor of London present - arrived on newly launched “Pearl”. • The fish market was moved from the quay and built at the back of the old Town Hall. • “Eclipse” launched by the London & Margate Steamboat Company in competition with the Gravesend and Milton Steamboat Company ships. • Heaviest snowfall ever recorded so early in winter (early September). • A barrel and finger organ installed in the west gallery of S.S. Peter and Paul Milton. • Public meeting to discuss the provision of a pier. The voting was against - many watermen opposed it. • William Pitcher constructed landing jetty at Northfleet, used by 40,000 people during the season. It is estimated that 240,000 passengers came to Gravesend and £998. 13s. 5d. was received in tolls. • The Corporation promoted a Bill in Parliament to enable provision of a pier despite the objections of the watermen. • Population of Gravesend and Milton 9,445. Population of Northfleet 2,124. • A Bill to sanction the pier was defeated, but a resolution was passed by the Corporation to erect a temporary pier. The first issue of the “Gravesend Magazine” appeared with an argument in favour of the new pier. • About fifty special Constables were sworn in by the Mayor in anticipation of trouble at the Mayor-making. The Corporation, in procession, headed by the Mayor had to run down the High Street to the “Falcon” with the protection of the special Constables. • A census taken showed 454 watermen at Gravesend of whom 391 were registered as working watermen upon the pier. 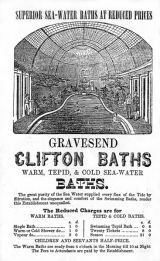 • Cholera epidemic in Gravesend. • A further Cholera epidemic occurred. • The “United Kingdom”, a West Indiaman, with a rich cargo was run down off Northfleet by the steamer “Queen of Scotland”. • New Pier Bill promoted and a temporary pier proposed, to be built by Mr McIntosh. The temporary pier was badly damaged by the watermen who rioted. The Riot Act was read and troops from Tilbury and Chatham were called in - the pier was repaired and opened. • The Town Quay Act received royal assent for the building of a permanent pier, next to the quay. • 290,000 passengers were carried in steam packets to and from the town. • William North appointed Inspector of the Watch consisting of 6 regular watchmen armed with cutlasses. The town was divided into 6 districts, one watchman appointed to each. • A waterworks was established in the town. Two steam engines raised the water from a well on the east side of Windmill Hill. 500 tons of water were distributed daily through pipes to the inhabitants. • The “New Steam Packet Company” was formed. This later became the “Star Company”. • River traffic was landed at West Street jetty pending construction of the new pier. Mr William Woods tender of £8,700 for the construction of the new town pier was accepted. • The New Steam Packet Company launched their first steam packets “Medway”, “Comet”, “Mercury” and “Star”. • The Town Pier was formally opened and the watermen were compensated for their loss of income. 300 guests attended a grand opening with a banquet. • The last tilt-boat “Duke of York” was withdrawn from service. • Blockhouse Fort site sold by Board of Ordnance to “Four gentlemen of Gravesend” (Cruden and associates) for £7,000 after the Corporation had turned it down. The site was later developed as the Terrace Gardens. • The temporary Terrace Pier opened, also the Terrace Gardens, on the Blockhouse site. • The Free School, founded in 1580, was united with the National School. A new building was erected on the site in King Street. • The Municipal Corporations Act confirmed the Charter, which made changes to the number of councillors and introduced the charging of rates upon the inhabitants. • A Borough Police Force was established with William North as first Chief Constable overseeing both night watchmen and day police. A station house was built next to the Town Hall (High Street) and remained the police station until 1940. 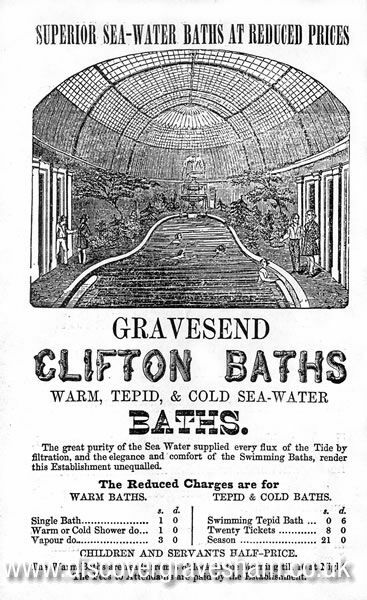 • Clifton Baths re-built in sumptuous oriental style along with the Clifton Hotel and Clifton Terrace. • A Doric front was added to the new Town Hall. • The “Gravesend Freehold Investment Company” was formed to develop Milton Park Estate. This included Harmer Street, named after James Harmer of Ingress Abbey, Greenhithe and Alderman of the City of London. • Surrey, Kent & Sussex Bank (later London & County) opened in Lower High Street.